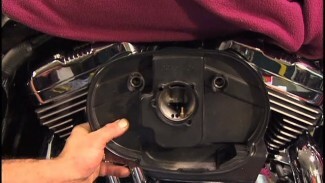 If you ever lose the key to your Harley Davidson or purchase a used Harley without keys, you will need to replace your ignition switch and fork lock assemblies. These assemblies are, typically, keyed to match. That is, you should be able to use the same key for both ignition switch and the Harley fork lock. With this Twin Cam Softail stripped down to it’s bare frame, we thought it would be a good time to demonstrate the removal and replacement of the Harley fork lock assembly. The most time consuming and labor intensive part of this repair is removing the front end of your motorcycle. The lower tree and fork stem must be removed in order to remove/replace the fork lock assembly. (See our video on the front end). Once the fork stem is out of the way, you will begin by drilling a small 1/8″ hole through the small lead plug located in the frame, beneath the lock assembly. Gently drill through the plug and stop drilling as soon as the drill bit is through. There is a set screw behind the plug that you will not want to damage. Twist a sheet metal screw into the lead plug. Now, pull the plug out with a pliers and loosen the set screw. You can pry out the lock with a screwdriver from inside the neck. Before moving forward and installing a new Harley fork lock, it is important to not only verify that you purchased the correct replacement assembly, but you also need to verify that the new keys work correctly in the replacement lock and ignition switch. Install the new lock into the frame. Orientate the flat area of the lock so that it will line up with the set screw. Snug the set screw but do not over tighten. If the set screw is too tight, the lock will not function smoothly/correctly. After reinstalling the front end and testing the key one more time, a wipe of black silicone will seal the set screw and the assembly from the elements. 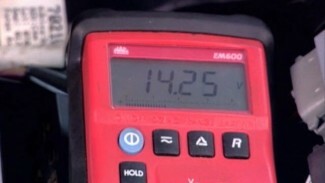 Remember, we always suggest servicing your way in and out of a repair. With your front end removed from the motorcycle it is the ideal time to inspect your neck bearings and races. Replace, or repack as needed. 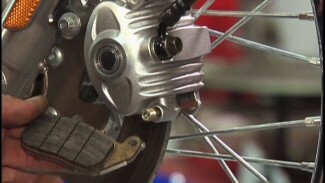 If your front brake line was disconnected, consider flushing the system if the fluid is old.